Hi everyone, im new to the forum and have been collecting glass for a couple of years. I recently came accross this vase and wondered if anyone could help me identify it. Its 6 inches high and has a ground out pontil (not very neatly) and has quite alot of base wear around the edge of the foot, probably 1930s. Any help would be much appreciated. I love it! Click for GlassGallery link with a click to enlarge option. If it is Haden, Mullett & Haden, it is an important piece for the history of Stourbridge glass. Oh goodness ...I'm going to be wrong again, but I would vote Stevens and Williams. It looks very similar to the cloudy swirling on a large pink vase I have, with the exeption of the round whorl on it and the ground out pontil (mine is a large polished pontil mark) - I've posted a pic of my vase. It's not the best to show the swirling but the swirling on the interior is a cobwebby white like your vase. M â€” Please forgive me for asking, but I would be interested in how you arrived at the S&W attribution for your vase? I'm not disputing it, but you may well have access to sources of which I'm not aware. Richard there is a better picture of the cloudy white bit but not of the inside - I'll try and do one later. 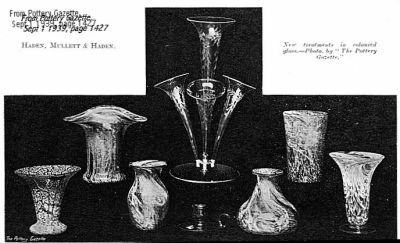 looking at Charles Hajdamach's 20th century british glass Graystan did do a similar shape (page 92 plate 177) though the foot doesn't look the same but then on page 88 plate 168 the red cloudy vase has a very similar foot to Richard's piece and a similar cobwebby appearance. although this one is much brighter coloured but the use of white glass is very similar. Just to add that I found my vase less than a stones throw from Amblecote! I'm going off my S&W possibility having photographed the close up. The colour doesn't look to have been made in the same way. Mine looks as though it is white swirls within a pink glass (I've attached the pics anyway for reference). The colour on yours looks to have been applied differently, so Bernard's possible HMH looks a closer bet (and also maybe Gray-Stan?). As a matter of interest, is the glass on the foot of yours a slight yellowish colour or completely clear? Also does yours have lots of tiny bubbles in it? The foot on my vase is completely clear with no air bubbles, there are a few larger air bubbles in the body of the vase but looking at your lovely S&W vase, which has alot of small air bubbles, they are quite different. I believe that you will find that your vase is pre-war Nazeing. It is known as a Tapering Vase shape no. 2021. If the vase is the only one I recall being at Fieldings with the HMH attribution, it was actually WMF and not HMH. Identified as such by a number of experienced dealers at the time, despite the provenance of the collection it was from.